Nehemiah 7:70-73 70 And some of the heads of the fathers’ houses gave to the work. The governor gave to the treasury one thousand gold drachmas, fifty basins, and five hundred and thirty priestly garments. 71 Some of the heads of the fathers’ houses gave to the treasury of the work twenty thousand gold drachmas, and two thousand two hundred silver minas. 72 And that which the rest of the people gave was twenty thousand gold drachmas, two thousand silver minas, and sixty-seven priestly garments. 73 So the priests, the Levites, the gatekeepers, the singers, some of the people, the Nethinim, and all Israel dwelt in their cities. When the seventh month came, the children of Israel were in their cities. The mortar had to be purchased. It did not just fall out of the sky. The stones had to be ordered. They did not just chisel themselves. The tools had to be bought. They did not just appear out of thin air. The people had to work together and give money towards the cost and expenses of the project. This is very important to understand. Just because God did a powerful work does not mean He violated natural laws and human laws. Even though God was ultimately doing the work, the people also had to do their part. Just because God is behind all that is happening at Clearview, it doesn’t mean that the concrete, bricks, and lumber will fall out of the sky; it doesn’t mean the trusses will build themselves and the roof will grow on it. It requires our financial support. I titled this message – “Getting a Handle on Money” because how we give money towards God’s work has a direct impact on what happens to money in our own hands. In other words, how you give is how you keep. I. EVERYONE WAS EXPECTED TO GIVE. 70 And some of the heads of the fathers’ houses gave to the work. Background: Who were the “heads of the fathers’ houses?” The father’s house is the extended family unit between the larger tribe and the individual family unit. The larger tribes would be the tribe of Judah, Benjamin and Levi. Under each tribe would be many extended families – the family of Arah, Elam, and Azgad. Under each extended family there were hundreds of individual family units of husband, wife, and their children. The heads of the fathers’ houses set the tone for their children, grandchildren, great-grandchildren to give. So the heads of the extended families gave but it doesn’t stop there. “The governor gave to the treasury” – Some translations have the word “Tirshatah” which in Hebrew literally means “the one to be feared or respected.” It was the title for the governor. Who was the governor? I believe the governor was none other than Nehemiah. He was not there just barking orders but he invested his own money. At Clearview, we believe that leaders should lead in giving. That does not mean that you should be the largest giver in the church but you should give proportionately to your income. Someone here makes $10,000 a month and they give $200 but another person makes $1000 and gives $100. Who is giving more? The one who is giving $100. So the heads of the extended families and the governor gave but it doesn’t stop there. 72 And that which the rest of the people gave – Who are they? Everybody else. II. EVERYONE GAVE ABOVE AND BEYOND. How much did the governor give? 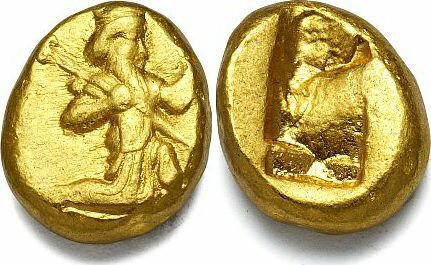 Verse 70 The governor gave to the treasury one thousand gold drachmas, What is a “drachma?” It was actually aPersian gold coin called “daric.” The word “dari” was an Old Persian word for gold. It was 98% gold and 2% alloy for hardness. It weighed about 1/3 of an ounce. One Daric could buy you an ox or pay a soldier’s salary for a month. That is a lot of money! How much did Governor Nehemiah give? 1000 gold drachmas = 20 pounds of gold besides fifty basins, and five hundred and thirty priestly garments. How much did the heads of the fathers’ houses give? Verse 71 twenty thousand gold drachmas, and two thousand two hundred silver minas. What is a “mina?” It was a Babylonian silver coin. One mina = 60 shekels. One shekel was the average monthly wage and so one mina would pay an average worker for 5 years. That is a lot of money! – We have just returned from Babylon. We are just getting settled. We don’t have a stable job. – There is no guarantee if this project is going to work. What if it all fails? – We don’t live in Jerusalem. It’s not going to benefit us. – We are helping out at the building. We don’t have to give any money. – Nehemiah’s got all the money. Let him give. The heads of the families have all the money. Let them give. These people could have made every excuse in the book but they didn’t. They gave above and beyond. They gave sacrificially. They gave overwhelmingly. – “Tithing is Old Testament” – Abraham gave a tithe way before Moses ever gave the Ten Commandments. In fact, in the NT, tithing is just the starting point! – “Just cause I don’t give doesn’t mean I don’t love Jesus”—Like the bumper sticker: “Honk if you love Jesus.” I heard of another one—“Tithe if you love Jesus. Any fool can honk.” When John Wesley would visit his congregations he would often ask his assistants about their progress in the faith. He would often ask if their Christianity had affected their pockets. That is the real test of what we believe. We have yet to love God with our wallets. – “I give what I can”—You are to tithe on your gross not on your net. When you tithe on your net, you are in essence saying that the government not God gets the “first fruit” of our increase. If you are throwing in $5—are you only making $50 per month? I give $50; are you only making $500 a month? Application: This is a tough message but it is desperately needed. Are we stealing from God? Are we playing safe? Are you hiding behind someone else’s giving? III. EVERYONE BENEFITED FROM GIVING. 73 So the priests, the Levites, the gatekeepers, the singers, some of the people, the Nethinim, and all Israel dwelt in their cities. Background: Because the people gave financially, the wall of Jerusalem was rebuilt. Stability, peace, security, and prosperity returned to the nation. Their enemies realized that the Jewish people were back in control and they were afraid to attack them and vandalize their cities and their properties. What’s more? “When the seventh month came, the children of Israel were in their cities.” Not only did they build the wall in record time but they also repopulated their original cities in record time! Just in time for the Feast of the Trumpets, the Day of Atonement, and the Feast of the Tabernacles. Isn’t that amazing?! Everything was a testimony to the hand of God upon His people. When we give faithfully, God does things with our tithes and offerings that are way beyond our imagination. We get much more than we bargained for. For e.g. The first check that Nicole writes in our home is the tithe check. Does it get tight sometimes? Yes it does. It is a sacrifice but God wants us to feel the pain when we give to Him. It is a reminder of the pain that the Father felt when He gave His Only Son to die on the cross for our sins. But every month God meets our needs in amazing ways. He always has. Not only that but He takes what we give back to Him and He multiplies it much much more. How awesome it is to see God turning our community around and changing the hearts and minds of men and women, boys and girls! 1. Is Jesus Christ your Savior? 2. Is in charge of your finances?